In a bowl, thoroughly combine the flour and all the ingredients up to and including milk, add the butter and stir into the mixture, leave to rest for approx. 20 mins. Melt the caramels with the cream and whisky, set aside. In a non-stick pan, gently heat a little butter, add 2 tbsp of the dough to the pan and, using a spoon, shape into a circle approx. 5 cm diameter, fry over a medium heat for approx. 3 mins. each side until golden brown. Repeat with the other 9 pancakes. 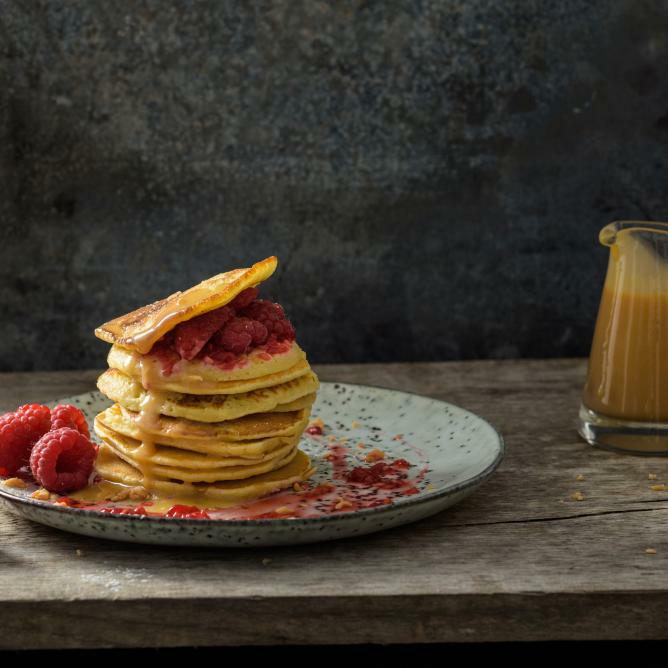 Divide the raspberries onto 5 pancakes and top with the remaining pancakes.